The frame construction of our Premier-Pro range has been designed to withstand the regular knocks and strains - whatever the weather - and whatever the use. The Premier-Pro range will give many years of reliable service. 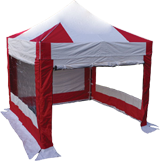 The Premier-Pro is the our top of the range instant marquee that is designed and equipped for the most demanding of uses - come whatever the weather or conditions. 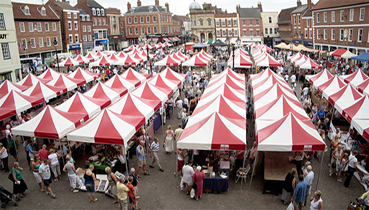 The ultimate marquee that delivers on quality, reliability and ease of use. Featuring a 6mm hexagonal ribbed aluminium frame construction with cast alloy joints, this top specification will offer many years of trouble free use. 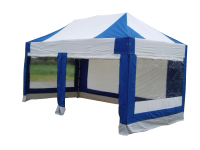 Complete with a swift shade 500g waterproof polyester/PVC Coated roof canopy, a range of accessories and side sheets to complement the range, The Premier-Pro is a unique design offering easy mobility and storage. Premier-Pro 6 mm hexagonal ribbed aluminium all frame construction - You don't get much stronger than this! *Easy Installation Compact fully tailored zip side sheets inc. x2 window panels. Side sheet sets are available as an option extra.